In just five short years, Swedish fantasy-themed Symphonic Power Metal band TWILIGHT FORCE have manage to gather quite the cult following: several times this year I've seen dedicated plastic sword-wielding fans standing in front of the stage at festivals, come rain or sun, eagerly awaiting these elvish warriors. And now, two years after their début full-length “Tales of Ancient Prophecies” TWILIGHT FORCE are back with its successor, featuring guest vocals from Fabio Lione and Joakim Brodén. 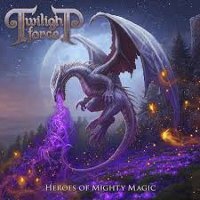 With the new release being entitled “Heroes of Mighty Magic”, all the Power Metal clichés are well and truly fulfilled, as one might await given their emphasis on the comic side of the genre. However, what was perhaps less expected is the absolute furore which the album sparked, with most reactions tending to on the extreme ends of the spectrum, with people either loving or hating it. Consisting of a dozen songs and spanning over 70 minutes, “Heroes of Mighty Magic” certainly doesn't skimp on the number or length of its songs. It is therefore no mean feat that the band manage to keep the album catchy and up-beat from beginning to end, although this was not enough to keep the album form becoming a bit long-winded to listen to in a single sitting. Starting off with “Battle of Arcane Mights” we are launched directly into the fray, with an overwhelmingly massive sound woven in with a tempestuous pace. This is one of the strongest songs of the album, and sets the bar high for what is to come. “Powerwind” picks up the baton and the pace, racing through a magical soundscape, alternating between galloping sprints and sections that almost seem to drag their heels. This combined with the overuse of jingling sound effects makes the song seem like something from a Disney movie. “Guardians of the Seas” has a slightly more nautical flair, but ends up somewhat lacklustre despite its promising start and forbidding undercurrents, although this is rescued by the outstanding guitar work later on. And of course no Power Metal band worth their salt would even dream of releasing an album devoid of dragons, so here we have the “Flight of the Sapphire Dragon”, another song rescued from becoming dull by impressive guitar work near the end. Following on from this fantastical beast we have the epic song “There and Back Again”, complete with frenzied guitars and searing solos, fulfilling yet another Power Metal stereotype: no album is complete without some reference to Tolkien's work in there somewhere. Many of the songs here are very symphonic laden, and rely on heavy orchestration, drums, and vocals to really deliver the punches, with the guitars and bass adding the basic speed and backbone to the music. Not to say that there's not a healthy dose of guitar solos thrown in: in “There and Back Again” a veritable maelstrom of guitar with the impetus of a cyclone swirls us off our feet, almost but not quite à la DRAGONFORCE. And of course, what would the album be without a strong lacing of catchy vocal choruses? Songs like “Powerwind” and “To the Stars” immediately fill in this gap, with the RHAPSODY-esque “Riders of the Dawn” possibly being one of the highlights of the album. “Keepers of Fate” is a lengthy affair which tends to drag on overly much, which is a further let-down after the sheer magnificence of “Riders of the Dawn”, one song before it. “Rise of a Hero” carries on in this mediocre vein, fortunately tempered by the splendour of “To the Stars”. Finally towards the end of the album we come across the title song “Heroes of Mighty Magic”. This is another 10 minute song which uses the time to build up a majestic atmosphere. In contrast to this, “Epilogue” is a whole different breed, incorporating over six minutes of spoke word, much to the chagrin of almost every fan. Finally ending off the album is “Knights of Twilight's Might”, the anthem of TWILIGHT FORCE. And admittedly, it has the catchy flair that could see this song take off as the quintessential TWILIGHT FORCE song. Does “Heroes of Mighty Magic” have songs about epic quests involving prophecies, dragons, and heroes? Check. Cheesy and fantastical choruses that will have you singing along on the very first listen? Double check. High pitched vocals from the get-go? Check. Sweeping symphonic sections that enwrap you completely? Check. What we have here is a exemplary but alas stereotypical Power Metal piece that has all the necessary trimmings. Perhaps nothing new or genre defying, but solid nonetheless. And to be honest, it doesn't have to be new to still catch on like wildfire. The songwriting is appealing but simplistic, using similar structures again and again. As a result, almost all of the songs have a very similar feel to them, and whilst each on its own is good, it does mar the album as a whole somewhat. This is made worse by those truly dazzling moments that show that TWILIGHT FORCE are capable of so much more. The production and mastering of the album are also done with particular emphasis on the effect rather than the force, allowing the symphonics to really come to the fore, albeit at the cost of some clarity. Whilst it is impressive that they were able to juggle so many layers, clearly parodying the genre, the overuse of every single element key to Power Metal has made the album over-the-top, leading to a release that sounds like a cross between a Power Metal album and a Disney soundtrack. However, if you're looking for some fun fantasy escapism, look no further, and these songs will likely be killer live. Nevertheless, the fact remains that whilst “Heroes of Mighty Magic” is boisterous and fun, these six Swedes could have done better to prove their mettle and show the world that they're a force to be reckoned with.